Ian in front of the Enterprise shuttle prototype at The Steven F. Udvar-Hazy Center of the National Air and Space Museum, July 2010. Like everyone else of my vintage, I grew up with the shuttle program. I don't remember the first flight in 1981, so in my mind the shuttle has just always kind of been there. In another tab I have the NASA TV feed open, waiting for the final launch of Atlantis in, as I write this, about ten minutes. The end of the shuttle program just has me feeling melancholy and empty (and I'm getting a little teary, right now, listening to the flight controllers, who have just given the go for launch, talk about how wonderful their team is). I agree that it is a program that is well past its time; I'm just sad that there isn't anything immediate on the horizon to look forward to. I was a big space junkie as a kid. As a very small child I would tell people I wanted to be an astrophysicist (a big word for such a small person! ); eventually that morphed into wanting to be an astronaut. The Challenger accident came at the height of my I-wanna-be-an-astronaut phase. I was eight years old, in second grade. I was fascinated by space and by the space program. I had a telescope and books galore about astronomy. I knew the astronauts' names, not just the famous ones like Sally Ride and Christa McAuliffe, but the lesser-known ones too. I had a map of the moon and a picture of the space shuttle on my bedroom wall in place of preteen heartthrobs. I was going to be an astronaut. But that dream came falling down back to earth along with the pieces of Challenger -- I was adventurous, sure, but I was not a daredevil. I somehow didn't know how dangerous spaceflight was....how would I? Why would I? I was eight years old. Spaceflight tragedies were ancient history to me. Challenger was what grounded me, what banished my innocence and my feelings of invincibility. I wanted it to inspire me, to make my desire even stronger, but instead it was what made me realize that I am, at heart, pretty cautious. I'm not cut out for soaring. Years later, when I heard the news about Columbia, I felt eight all over again. I learned the news when I turned the computer on. The headline said "Space Shuttle Breaks Up Over Texas" and I had to read it seven or eight or nine times before the meaning sunk in, before I realized what the words implied. And like I did on that day in 1986, I turned on the television and watched the fireball, over and over again, repulsed by what I was seeing but unable to turn my eyes away from it, drawn to the peculiar beauty of the contrails, wondering what it would feel like to fall from so high. In between, of course, and in the years since Columbia, there were plenty of "normal" launches. I didn't watch many of them, but especially in recent years I always tried to keep up with when launches were happening and what was going on with the program. I always wanted to go to a launch but we were never able to schedule our Florida trips accordingly, though we did go to the Kennedy Space Center a few years back and marvel at the launch pad and the vehicle transport machine that moves the shuttle to the pad. 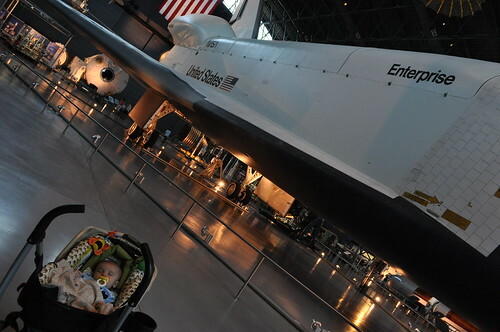 It's odd to think that Ian will grow up not remembering the shuttle at all; it will be as foreign and long-ago to him as Mercury and Gemini and Apollo were to me. But I hold out hope that in his lifetime -- with any luck, early enough in his lifetime to catch his interest and inspire him -- that we'll go back. Back to the moon, yes, but beyond that. We've been in low earth orbit for a LONG time now -- it's time to stretch our horizons and go, if I may be cliche about it, where no man has gone before. ...And there she goes. And there go the tears in my eyes, once again. Safe travels, Atlantis. Thank you. I keep thinking of things I want to write about here, but never actually get the motivation (or time) to do it. Or really, to be fair, it's that I don't get the time or the motivation concurrently. I tend to want to write when I'm, say, driving, but when I have the time to do so I feel like just zoning out in front of the television, or else I feel mandated to do something productive like wash the dishes or fold the laundry. I'm back at work now, which is another reason behind the not-blogging. Right now I'm half-time. I'm actually kind of enjoying it -- I'm out of the house for 2.5 days a week, and get to spend the rest of the time with the little guy. It feels pretty much perfect. Problem is, after a few more weeks I'll be back full-time. I don't think that will feel so perfect. We'll see how that goes, but I really do think I want to be part-time permanently. I've always sort of regretted the fact that I live in a country and an era that doesn't really "do" hats. I don't need to tell you, then, how delightfully fabulous I found these compilations of hats from this year's Ascot. It looks like I'm going to have a bumper crop of lavender this year (I've gotta take some garden pictures to share! ), so I might want to consider making some lavender wands. Ever since getting pregnant last year, I've found it really difficult to read. I can handle short little things like magazine articles, and I've read a few books here and there (probably still more than a lot of people manage, but for me it feels like I might as well have read nothing), but the interest just isn't there. Which makes me sad -- I love reading, and plus, hello, librarian. But there is the ugly truth. Sigh. One of the books I DID manage to read was The Happiness Project, and here's an interesting post from The Happiness Project blog on how to read more. Have you got your own tips? How do you get back your reading mojo when you've lost it? The person who wrote this must know me. I am lusting after one of these bags. Right now our diaper bag is a Columbia backpack, which is great for when we're out hiking or whatever (and it's a good manly bag for Jim, when he needs to be in charge of the bag), but I have a bit of a bag problem, as many of you know, and I want something prettier! 1) The music. I LOVE Christmas songs. I'm not one of those people who listens to them in July (and in fact, I don't WANT to hear them in July), but as soon as Thanksgiving is over, I've got the Holiday Music playlist on the iPod going full-time. I'm told that the Pandora holiday stations are good too - gotta give those a whirl! 2) Buying gifts. I really, truly enjoy buying gifts for people. Often we exchange lists among our close family members, but I especially love it when I come up with the perfect gift without having to consult a list. I don't stress out about it - I just have fun. And I love how the tree looks with all the wrapped stuff under it. 4) The tree. I love going to a tree farm, picking the perfect tree, and schlepping it back home again. Once we moved on from apartment living we started cutting our own tree every year, and I don't see us changing that anytime soon. 5) The smells. The aforementioned freshly-cut tree. Cinnamon. Baking. My various scented candles that just smell like Christmas to me (Balsam and Cedar from Yankee Candle is my very favorite!). 6) Decorations. The more glitter and sparkle involved, the better. I probably like things that verge on tacky, but if Christmas isn't the time of year for such things, I don't know what is. (I'm pretty low-key the rest of the year in terms of tchotchkes and whatnot, so I think I can go crazy for a month!) I love making the house all twinkly at Christmas. 7) Time with family. It's the one time of year, generally, that our entire family is together all at once, and we always have so much fun. We're so lucky to have largely low-maintenance families where everyone gets along and there's very little to be had in the way of Drama. 8) Snow. OK, we don't always get a white Christmas, even here in the land of allegedly perfect and idyllic winters, but I love it when we do! 9) Christmas cards. Snailmail seems to be virtually obsolete these days, so I love checking the mail every day and [hopefully] finding something other than bills and junk! 10) Quiet time. 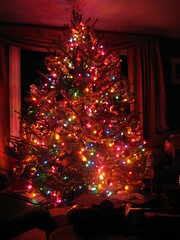 I try to end each day with some quiet time - sitting in the dark in the living room with just the Christmas tree lights on, maybe with some carols playing. It's so peaceful and rejuvenating for me - almost meditative, really. Sometimes it makes me a little sad and nostalgic for years gone by and people who are no longer with us; sometimes I think about what future Christmases might be like; sometimes I actually reflect on my life as it is now. It's like my own internal Dickensian spirits (a la A Christmas Carol), all brought out by some multicolored lights and glittery ornaments. When I visited Normandy while I was studying abroad, I was able to go to the American cemetery in Colleville-sur-Mer, overlooking Omaha Beach and the English Channel. It is the final resting place of 9,387 American soldiers, largely from the D-Day invasion but from other World War II operations as well. The cemetery is a sad and lovely place, perched atop a bluff overlooking the sea; I remember it feeling isolated and removed from the rest of civilization, silent but for the breezes and the birds. 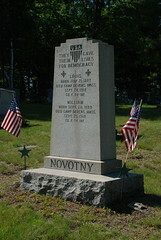 The graves all face west, towards the United States: rows upon rows of stark white crosses and Stars of David. I remember thinking, as I walked among the graves, how sad it was for the families of these soldiers -- I'm sure many of them were never able to visit the graves of their loved ones. 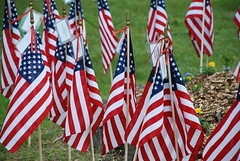 I go to our town cemetery each Memorial Day. The main purpose of the trip is to plant flowers on my father's grave (since Memorial Day weekend is the traditional planting weekend around here - no more frost danger at this point) but while I'm there I walk around and look at the stones. While it's still an active cemetery, there are graves in it that go back as far as the early 1800s. Today while I was strolling, I found myself thinking about that cemetery in faraway France, and reflecting on the different ways we honor and remember these soldiers, whether they are buried near where they fell or in their hometowns, alongside their parents and their wives and their children. These brothers both died at Fort Devens, Massachusetts, within a day of each other, during the Spanish influenza outbreak in 1918. 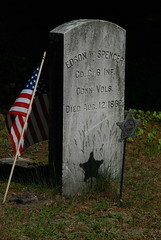 There are a number of gravestones of men who died in the Civil War. This is amazing to me -- my town is so small, and there couldn't have been that many people living here at that time...and yet, all of these gravestones, plus however many are in the town's other cemeteries, or in the military cemeteries. Each of these deaths must have touched so many people here. I wonder, was it some comfort to these mens' families that they were able to be laid to rest at home rather than half a world away? Would it matter to you if you lost someone you held dear? 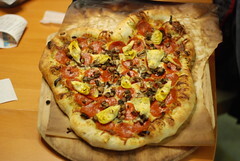 So...we don't do any of that sort of thing, but we had pizza for dinner last night and Jim made it in a heart shape. 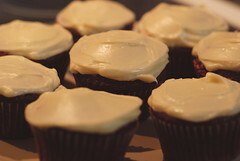 And I felt like baking, so heart-shaped pizza was followed by red velvet cupcakes. 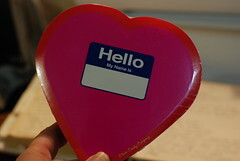 The time to buy Valentine candy is, as far as I'm concerned, is after Valentine's Day, when it's all on clearance. Jim went out to Target today to buy toothpaste and a new phone for the house, so he picked some up while he was there (including conversation hearts -- my favorite!). He got this one because he knew it would tickle my funny bone, and indeed it did. I hope you had a hearts-and-flowers-filled day if that's your thing, and a pleasant weekend if it's not! xxoo to you all. 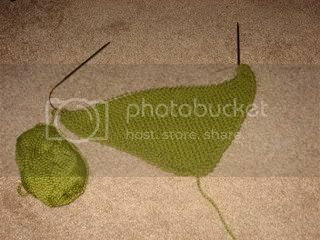 Next post: knitting! I think. Fill up the larder - storm's a' comin'! As luck would have it, though, today we really did need milk and toilet paper (we were all set in the bread department, though). I always feel like a gigantic moron shopping for these three items before the onset of Weather -- I want to hang a sign around my neck that says "This isn't Storm Milk, it's regular milk!" Today, though, I avoided the embarrassment by sending Jim out to join the throngs fighting over the last package of Quilted Northern. I'm happy to report that the snow has started, but that we have plenty of milk and toilet paper to last us until the storm lets up. Which will be, you know, TOMORROW. That's the thing I really, REALLY don't get about pre-storm buying: we generally don't have multi-day weather systems around here. 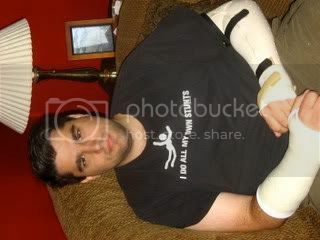 It's not like you're going to get osteoporosis if you run out of milk and can't get out to get any for twelve hours. Sheesh. And even if it were going to be a long Weather Event, wouldn't you be better off with bottled water in case the power goes out? Canned goods? Coffee, for pete's sake? Anyway. I'm sad to report that the storm did throw our weekend for a loop, though: we were supposed to celebrate our birthdays today with Jim's family, which didn't happen, and we decided that we'd skip the symphony tonight (we have a subscription) because of the weather. It's just as well, though -- Jim isn't feeling well and is currently laying in a heap on the couch with a therapeutic feline on his lap. So, snow or not, we'd be having a quiet night at home. I'm at a loss, though -- I'm on my own for dinner, and it would hardly be nice to bake the cake I was planning when Jim's tummy is acting up, and I can't even go knit in the living room because Jim's sleeping in there with the lights off and I don't want to disturb him. Oh well. Tamara tagged me a long time ago to do this meme, and, well, I forgot. :-P But as I'm hurting for content (once again, I'm waiting until I have a chance to upload some pictures), better late than never! I'm going to forego the part where I tag other people, though, as everyone and their mother has done this meme by now! 1. What was I doing 10 years ago? Let's see -- June 1998. I had just finished my sophomore year of college. Jim and I had just gotten our first apartment -- we moved in with a friend of ours, as both of his roommates graduated and were moving out. What with the new apartment, we stayed in Rochester for the summer. Jim was an intern at Xerox, and I was continuing my school-year work-study job as a lab assistant in the Brain and Cognitive Sciences department at the University of Rochester. 2. What are 5 things on my to-do list today - in no particular order? Work; dinner with K; buying stamps and sending a couple of cards; spinning some more of the fiber I'm working on; washing and folding a couple of loads of laundry. Thank you for the suggestions for post topics! I will address them all in future posts. Today, though, a post fell into my lap. Jim is a big fan of Terry Pratchett. He's read all of his books (I think he owns them all as well) and has been trying to get me to read them for some time. I resisted for quite a while, but I finally gave in and am now working on my third one (I read Reaper Man and Equal Rites, and now Going Postal). They're really quite good and I am enjoying them immensely. Jim's recommendations don't always do it for me (he reads a ton of science fiction, which is generally Not My Thing) but in this case, he hit the nail on the head. Today, though, I saw in the news that Pratchett has been diagnosed with early onset Alzheimer's, which made me so sad. I've known people who had early onset Alzheimer's, and I have a couple of family members and friends who are currently dealing with potential diagnoses (not Alzheimer's, but other possibly debilitating conditions) and so I think the news hit me differently or more personally than it might have otherwise. Sigh. I hope he still has many good years ahead of him. And unrelated except for the fact that I also learned this in today's news, Merriam-Webster has named "w00t" the 2007 Word of the Year. Seriously? w00t? Tamara tagged me some time ago (while I was on vacation, I think) to do this meme! 1. I didn't have a bedtime when I was growing up. My assumption has always been that Mom and Dad simply figured that if we were tired we would sleep, but Mom, feel free to chime in with a comment and explain your reasoning, if my assumption is wrong! My parents were both night owls, and my sisters and I all are too (though my sister M seems to vacillate -- she was a morning person when she was younger, but she seems to have come over to the dark side as an adult). So during summer vacation it wasn't unusual for us to stay in bed till 11am -- and, on the flip side, be up till 11pm or midnight. Yet we all grew up to be more or less well-adjusted. Go figure. To this day, though, when I hear about kids who get their parents out of bed at 6am (or earlier! ), it makes absolutely no sense to me. And that having been said -- I like my downtime, and if I had kids I can't imagine not having enforced adults-only time at night. I don't know how Mom and Dad did it! I do hope, in any case, that my hypothetical future children will inherit their height from their father and not from their mother! 4. I love perfume, and I love the idea of perfume, but I have never been able to get into the habit of wearing it daily. I remember now and then, but as a general rule it seems to be one thing I just can't work into my morning routine. I'm sure there are people out there with allergies who are thankful, and to you I apologize that I ever remember at all! 5. I hate going barefoot. I don't know why, but I do. I shouldn't say I never go barefoot, because that's not entirely true as I do sometimes walk around the house with bare feet, but 99% of the time I've got on slippers, socks, shoes, or some combination of the above. I'll even slip on shoes to walk the ten feet from the living room into the kitchen. Maybe it's because my feet are often cold, maybe it's because I don't like my feet to be dirty, or maybe it's just because I like shoes so much. In any case, it's a good thing I don't live in Japan. 6. I Do Not Want a dog. Don't get me wrong -- I like dogs just fine, and over the course of my life I have had dogs that I was very fond of (and currently have a number of dogs in my extended family, as it were, who I like quite a bit and enjoy spending time with), but I don't want that kind of responsibility at this point in my life. (I accept the fact that I may change my mind someday.) I like animals that are a little less reliant on attention and assistance from their humans...like, say, cats. I like the fact that cats don't need to be walked; can be litter-trained; bathe themselves; don't bark; and take up small amounts of space. So let me play with your puppy, but please don't try to send it home with me. 7. I always wanted to learn how to play the piano and/or a stringed instrument -- I could never decide whether I'd prefer a violin, a viola, or a cello. I know it's too late for me to ever be a Great Musician, but I like to think that someday I'll have the chance to try one of them out. In the meantime, I should haul out the clarinet and re-learn that! 8. If I won the lottery, I would move to a house with a garden and hire a gardener to take care of it for me. A real garden, I mean, like one of those English country estate gardens. I don't have the inclination or the skill to actually care for a garden like that on my own (I'm doing well if I manage to keep my tiny little container garden alive), but I would like nothing more than to have a garden like that, and to be able to sit outside in it, amongst the flowers, and drink tea. Failing that, I would buy a house within walking distance of a park with such a garden (like the International Rose Test Garden in Portland, or the botanical garden in Montreal), and I would spend as much time there as I could. 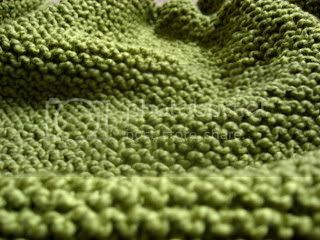 There's only so much you can say about an ocean of garter stitch. The blanket is growing larger, more slowly now as each row is longer than the last and I am nearing the widest part. 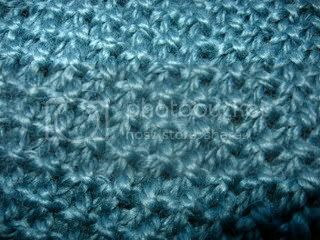 At times I get sort of frustrated by that -- it's one of those situations where I knit and knit and knit and the whole thing only grows by an inch -- but I keep reminding myself that once I hit the halfway point, each row will get shorter and my progress, measured in inches, will get faster and faster. This is going MUCH more quickly than the last baby blanket I knit, too -- I made that one only a short time after I started knitting and while I wasn't blogging at the time and consequently don't know how long it took me from start to finish, I DO know that it was a relatively major undertaking, time-wise. I knit a lot faster now! It's Educator Discount Week at Borders, and last night we went and dropped a chunk of change. Not that we need much incentive to visit the bookstore anyway, but 25% off everything is irresistible. Now I need to actually read some of the books I've managed to accumulate over the last few weeks -- we've had more bookstore trips than usual lately (it's a regular weekend-night excursion for us), plus I've bought some used books from the library. We need more bookshelves -- which means we need a bigger house! ;-) That's not in the cards for a while yet, though, so in the meantime we'll just have to double- and triple-stack even more than we already do. And what did I get? There were some hardcovers on the 3-for-2 table, so I picked up three books that have been on my wishlist: Thunderstruck by Erik Larson, Mayflower by Nathaniel Philbrick, and The Omnivore's Dilemma by Michael Pollan. I've read a few novels lately (my coworker Ann, who knows how much I like nonfiction, reacted with amazement when she saw me returning a couple of library books recently. "But those are fiction!") so it's time to switch back for a while, I think. I also picked up Favorite Socks, the new book from Interweave Press. I've ogled it a couple of times at the bookstore since it came out, but hadn't purchased it yet. I couldn't hold back anymore, though -- I don't think there is a single pattern in the book that I don't like. I might not actually knit all of them, but they're pretty to look at. I feel like I'm ready to branch into patterned socks, having only done stockinette and variations on ribbing up till now, and as we move into the warmer months knitting small things like socks starts to sound extra-appealing, so... I also wanted No Sheep for You -- I flipped through Tamara's copy the other day and there are SO many nice patterns in it, but I decided to hold off on that one for a bit. No need to buy everything all at once! And on a completely random note: Jim bought me flowers, oh, three weeks ago? 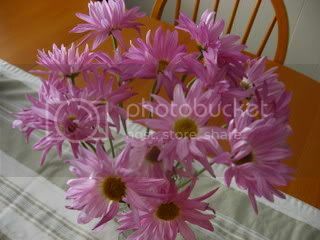 The roses and the other flowers have long since dried up and had to be discarded, but these daisy-type things (I am SO bad with flower names) are still going strong -- a little wilty, perhaps, but not too badly. I love flowers, especially ones that unexpectedly last a long time. Happy Spring! I really do enjoy winter (mainly because my very favorite wardrobe items are boots and sweaters) but hey, how can anyone NOT be looking forward to spring by the time March 21 rolls around? Heck, even my husband, who practically lives for downhill skiing, is ready for spring. For me, it's not just about the return of warm weather . I like what spring represents: new beginnings, new life, a time to start over. I've often thought it would make a lot more logical if New Year's Day were tied to the beginning of spring; failing that, wouldn't it make a certain amount of sense to make new year's resolutions around this time of year rather than in the dead of winter? What better way to celebrate spring than with a new baby? Good friends of ours are expecting at the beginning of June, and I've been working for the last few days on a baby blanket for the new arrival. In this picture, the color contrast sort of hurts my eyes! It's not quite as eye-crossing in real life, but it's plenty bright! It's quite large, too -- I can't wait to see how much it will shrink in the wash. Before I felt, though, I need to knit the i-cord. And I HATE i-cord. I can't tell you why -- it's one of my inexplicable little knitting idiosyncrasies. I think I have two felted bags that are done except for the i-cord handles. (Hi, Mom!) I need to just buck up and do it. 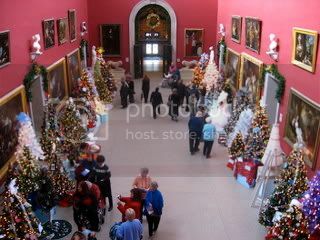 Back a few weeks ago, I went with a friend to see the Festival of Trees and Traditions at the Wadsworth Atheneum in Hartford. I hadn't been in years, and it was really lovely. They put up trees, wreaths, and other decorations all over the first floor of the museum. 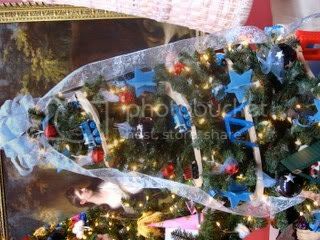 The decorations are made by different groups and individuals, and they're all sold for charity. All of the trees were gorgeous. Some were very traditional; others were a little more creative. I could fill blog entry after blog entry with some of my favorites, but I'll just share one that I particularly liked. I love how instead of garland, they ran the train track around the tree. All of the ornaments were either Thomas the Tank Engine-themed, or else color-coordinated. It was adorable. And check this out: I think I've found a solution for my "what to do with all my leftover yarn" dilemma. 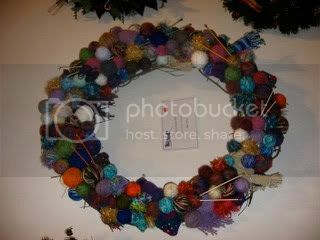 I LOVED this wreath, and it was definitely an eye-catcher -- while I was standing there admiring it, nearly everyone who walked by commented on it! The red dot on the label means that it had already been purchased. Too bad -- I seriously would have considered buying it. ;-) But instead, I'll just continue to save my scraps and make my own someday! I admit that I am feeling a little bit of guilt about having not done more Christmas knitting. I just don't deal well with the pressure of all those gifts at once, though (go ahead, ask me if I've mailed my Christmas cards yet!). 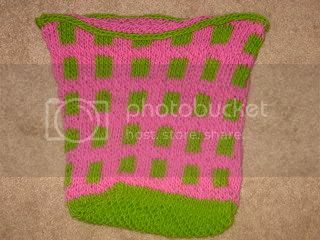 So I think my resolution for 2007, as far as gifts go, is to knit more for people's birthdays. (People with summer birthdays might get moved to Christmas, though. 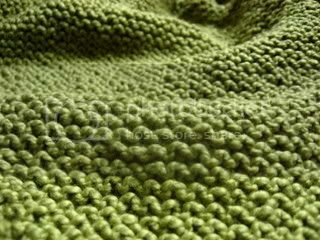 I think my goal is one knitted item per recipient per calendar year. :-)) At least birthdays are more spread out, so I don't have to stress quite as much. That having been said, of course, in both of our families, all of the birthdays come in big clumps. But I'll try my hardest. First up: my mother-in-law and my grandmother, both in the first part of February! I went to Ikea today to get a Poang chair. Right now, the chair in the corner of our living room is an antique rocking chair that my grandmother refinished and recaned for us as a wedding gift. I love it, but it's a little bit delicate and I don't want anything to happen to it, so I want to move it out of the living room so that it doesn't get such heavy use. I think that Poang chairs are about the most comfortable things ever, so that's what we've decided to get for the corner. (I think it'll likely become my Offical Knitting Chair!) Plus, it's just so much fun to say. PO-ANG. PO-ANG. Unfortunately, I struck out. I could have gotten a Poang in any color I wanted -- except for the one I wanted. ;-) There was a guy wandering around with the last black-brown chair frame in his cart. I asked where he found it -- it had been in the wrong place, and he wasn't even sure whether or not it was what he wanted. So I sort of hovered for a while, hoping that he would decide against getting it, but eventually I got bored, plus the store was closing, so I gave up. I did get the Poang footstool, though -- I am certain that when we go back to get the chair, the footstool will be sold out, since that's what always happens when we go to Ikea. I've learned to get what I want when I can, because next time it'll probably be "temporarily out of stock." So, no Poang for me, but I did get myself a pentapus. 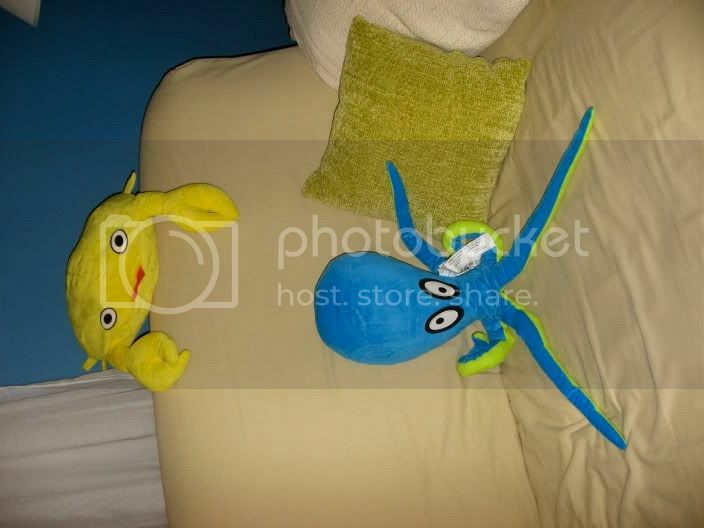 I like unusual stuffed animals, particularly stuffed sea creatures. But the pentapus makes no sense...why a pentapus? I mean, maybe making an octopus was cost-prohibitive, but why not a quadripus or a hexapus or a septipus? It was goofy (and cheap!) enough that I needed to have one. I have to say that Ikea New Haven is convenient and, yet, not. It's located right at the interchange of Interstates 91 and 95, which makes it really convenient in theory. In practice, though, the 91/95 interchange is, for my money, one of the worst interchanges ever. Far too many lane crossovers and always, always too much traffic. When we go to Ikea, we actually get off I-91 and cut through downtown New Haven and approach Long Wharf from the other way, avoiding I-95 altogether. But, you know, it beats going to New Jersey, which was the closest Ikea we had before this one opened!